I love a good bargain, don't you? When the receipt shows I've paid less than half the retail cost I feel like I've won a small battle; like I've out-smarted the man (whoever he is). But there is a limit to my bargaining. 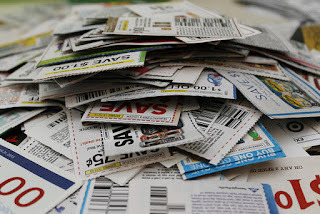 I don't price-haggle, travel more than 5 miles, snip piles of coupons, purposefully collect "magic" supermarket coins, or stockpile anything I'll never consume just because it's free. That's simply exhausting and wasteful. If I were brave enough to climb upon a hernia-sized soap box from aisle #10 I'd shout, "Stop playing games and just lower the prices! Keep it simple! The end. Amen." I just wanna purchase items at fair price without all the planning and strategizing. Guess what? We do not serve a $1.98 God. * When presented with our needs he doesn't ask for a coupon or bicker over the price. It's already paid for through Jesus and he generously gives us the best from his heavenly storehouses; rich, overflowing and limitless supplies of everything we need. And God always slips a little something extra into our bag just because he loves us. All he asks is that we say, "thank-you"--a heartfelt word of gratitude--and share with others. God keeps life simple. Out of a life of gratitude and thankfulness, he gives abundantly more than we can imagine and we walk away with free, joy-filled bags of the highest quality hope not only for ourselves, but also to share with those around us. Nothing ever goes to waste. Whatever we give away in his name, God always returns ten-fold. Amen! Be blessed by His glorious riches, today.